I am probably the last person in the world to have read The Sisterhood of the Traveling Pants. Believe it or not, I haven’t even seen the movie. I did, however, have it on my to-read list. When my dearest book friend, Kathy, come up with the wonderful idea for The Sisterhood of the Traveling Book club, I was excited to join. 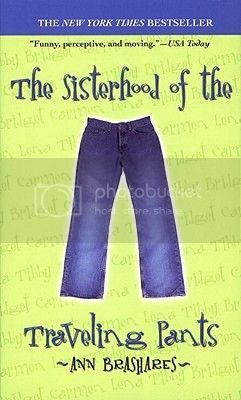 The Sisterhood of the Traveling Pants was our first group read! I know I would have eventually read the book, but I am so very glad that Kathy had me read it sooner. It was really wonderful! Each of the girls in the story were each interesting in their own way. Lena is quiet and introverted, just like me. (I was actually able to relate to her the most because of this.) Carmen was full of sass and wanted everything to be just her way. Bridget was the super-star athlete, and Tibby... well, Tibby seemed to be mad at the world. (Someone else I was definitely able to relate to when I was her age.) I really enjoyed reading each girls adventure with the traveling pants, and I was definitely able to sympathize with each girl’s story. I was also envious of the girls relationships with each other. Friends like those don’t come around often. There were a handful of secondary characters in the novel that I really cared for, maybe even more than the main characters in once case. That would be with Bailey, the girl that Tibby meets at her work. She was super snarky, and just flat out told you how things were. I loved her, and I loved her story. I will definitely admit, I cried for her. I don’t know what kind of magical jeans these are that fit each girl perfectly, but I definitely need to get me a pair of them. I love that the storyline revolves around the pants, and the girls sending them off to each other. It reminds me of a Flat Stanley project I did with my son a while back. It was so much fun sending our package to people all over! It would be something really cute to do with a group of friends. Overall; I really didn’t know what to think before I started this book. I have heard about it a million times, and even had the book on my shelf. But I never read it. I don’t know why. I am really glad that I finally did. Now I’m going to pass along this book to my teenager, and share the experience with her. I’m really looking forward to reading the rest of the series, and watching the movie as well! I *adore* this book - and the whole series! It's one where I actually thought the movie (the first one anyway) did a semi-decent job of showcasing the characters really well. I hope you continue with the series... on through to the final one, Sisterhood Everlasting. I definitely want a pair of those magically re-sizing pants. Then, no matter if I gain or lose, they'll always fit like a glove! Such a great story.